Images come from computer processing of MRI data; the processing reveals breaks in fiber tracts, or neuronal pathways. In our experiments, HDFT has been able to identify disruptions in neural pathways with a clarity that no other method can see. With it, we can virtually dissect 40 major fiber tracts in the brain to find damaged areas and quantify the proportion of fibers lost relative to the uninjured side of the brain or to the brains of healthy individuals. Now, we can clearly see breaks and identify which parts of the brain have lost connections. 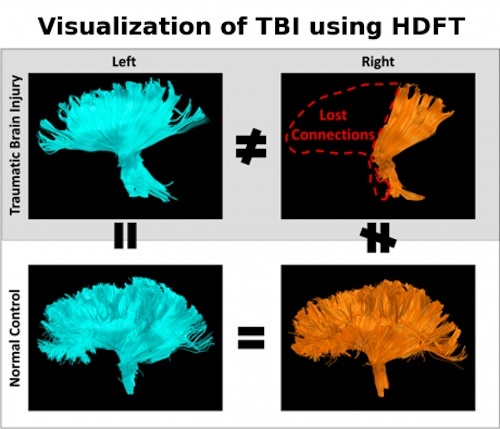 Schneider’s team reports using the HDFT technique in the case of a patient with traumatic brain injury in the Journal of Neurosurgery . The team hopes that HDFT will improve patient outcomes and increase the potential for rehabilitation in cases of traumatic brain injury.